As a home user and not very conversant with the technical aspects of computers, you need user friendly software to help you out. This is more so when you wish to take regular backup of precious data, videos, pictures and other files. You just cannot afford to take a chance and think your computer would work perfectly at all times. But what do you do when the different backup options you see in the market place are either too complicated to use or are expensive? You keep putting off the backup exercise only to find one horrible day that all data on your computer has vanished due to some technical problem like a hard disk failure. That would be catastrophic indeed, wouldn’t it? Fortunately, you have an option now. 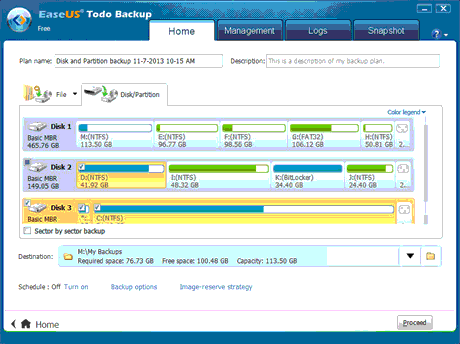 The EaseUs Todo Backup is your answer to all your backup needs. It is safe, hassle free and most importantly also free to use. This wonderful software will allow you to back up all your data in a trice so that you never have to worry about anything getting lost. The heartening aspect of EaseUs is its very intuitive interface. The software guides you step by step on how to accomplish the backup. If you are a newbie and not very comfortable with technology, you will find that you can do the backup without needing any technical skills. It is the ideal backup as well as disaster recovery solution for computer users at home. A handy one-click system you will find absolutely safe and trustworthy. The process does not cause any damage to your data. What’s more, you will as a user also get lifetime access to any version upgrades and updates without having to pay anything. The software is also ideal for any disk cloning, upgrading of the disk or for SSD migration. You can for instance clone windows 7 hard drive with it. There is no requirement of reinstalling any applications or operating systems. Once you install it, you would be able to recover any of the individual files directly using just the backup image. You can also now backup messages, call details and music files in your Android gadget with this software.